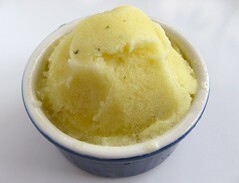 Pineapple-Basil Sorbet - Do You Know The Muffin Man? Notes: La Paloma, a Toronto gelateria, was the inspiration for this sorbet. I tried their version of pineapple-basil earlier this year and was struck by the tasty combination. I used Thai basil (which contributed some anise-like flavours) and only half the quantity called for in this time-consuming recipe. Also, I felt that 3/4 to 1 cup of lemon juice was too much, so I only used 1/2 cup. For texture, I left about a quarter of the puree unsieved. There's also green apple and lemon juice in the mix so the flavour shifts on your tongue. Another winner.